New course codes (versions) are mandatory from May 2012 – all courses completed under the old versions prior to May 2012 are still valid – 12 months for CPR and Advanced Resuscitation and 3 years for Apply First Aid and Provide Basic Emergency Life support. First Aid Action will provide you with the necessary skills to provide the primary care to an unconscious casualty in an emergency situation until the arrival of professional help. 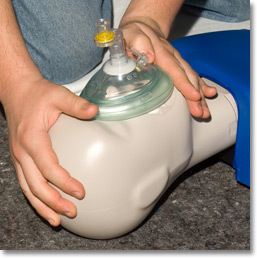 Cardio-pulmonary Resuscitation is a vital skill that can save the life of a casualty when they have stopped breathing. 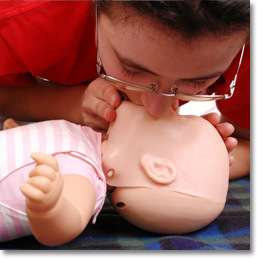 This course focuses on practicing this skill on our special CPR manikins (adults, junior and baby manikins). 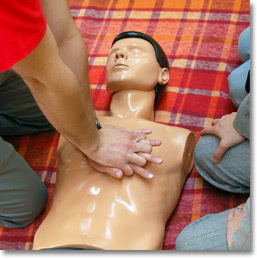 The Perform CPR course is conducted over 2 hours. Principles of First Aid, Legal issues in First Aid, examining a casualty, the chain of survival, basic life support chart, emergency action plan, managing the unconscious casualty, airway management, choking, rescue breathing & chest compressions (adult, child and infant), first aid hygiene. The Nationally Recognised Provide CPR certificate is valid for a period of 12 months. The Provide CPR course is conducted in conjunction with the Provide First Aid course or can be delivered separately by arrangement. First Aid Action is more than happy to conduct the program at your premises or join us at our venues at the Tingalpa Hotel (Tingalpa) and Brothers Leagues Club (Raceview) – please view our calendar on the home page. Please do not hesitate to call to make an enquiry when the next course is being held or to make a booking.